Proper and accurate course placement will result in higher retention rates. CollegeSuccess™ is a testing platform that utilizes computer adaptive testing (CAT) to accurately and quickly assess high school and incoming college students’ abilities and skills. Upon test completion, College Success™ delivers immediate online test results that allow multiple, real-time opportunities to make informed decisions. Additionally, students receive customized and streamlined instruction and resources to help them adequately and appropriately prepare for college success. Faculty members can also easily identify specific subject areas where students need help based on in-depth, diagnostic feedback. 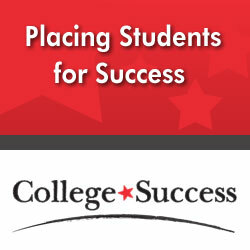 CollegeSuccess features a full set of Standard Placement Tests based on national educational standards. These are ready to go for institutions seeking an affordable, time-tested means to assess a students ability in Reading, Writing and Mathematics. Behind each placement test is a deeper analysis through a Diagnostic Assessments. Diagnostics report on each individual strand or competency and provide scores for each. This compares with a Placement Test which provides just one score where institutions typically align a target or cut score. Diagnostic results can be used to identify narrow deficiencies and deeper insight into a student’s understanding of the subject. Our company was founded with a patent for SpellCheck and has been innovating ever since. For higher education, we offer campus-wide tools to help students improve their writing and help administrators and academic leaders track results. CorrectEnglish® is a web-based application designed to assist students in the elimination of errors in writing by checking in real-time for contextual spelling errors, word substitutions via its over 63,000 advanced grammar rules. Powered by artificial intelligence, CorrectEnglish® allows students to practice their writing and receive instant feedback. The feedback includes help to improve the student’s style, content, focus, and organization and encourages them to improve by practice. CorrectEnglish® provides all the took necessary for students to master writing across the curriculum. In addition, onboard writing support with visual examples and annotative feedback across multiple genres in the software; students can select the Lexipedia search box to find definitions, synonyms, antonyms, and more. Additionally, students are provided with onboard access to our patented iseek.ai™ search engine to provide additional targeted resources aligned with the topic about which they are writing. Using a unique contextual search, iseek parses search requests to better understand specifically what the writer is looking for and returns more relevant, learning focused resources with fewer hits. CorrectVue™ is a cloud-based analytics tool which delivers detailed insight into the mechanics of student writing across an entire institution. Administrators can now track, record, analyze and gain insight into student writing. CorrectVue can be a dashboard into writing across the institution and by tying into your Learning Management System, shared drives and online repositories. Reports can segment sections of the institution, ranging from individual classrooms, support centers, learning communities, even colleges or entire divisions of your institution. Multiple levels of dashboard reporting can give executive to instructional perspective, tailoring the information to those who need it most. CorrectVue can also report into your Student Information Systems. CorrectVue can also integrate with our IntelliMetric automated essay scoring engine, adding a dimension that includes reporting on the consistency all grading as well as scoring of admissions essays, placement writing tests, first-year experience projects, remedial writing assignments, graduation essays, and even work done through career planning & placement. McCann Associates provides programs to assist students in sharpening their skills before entering their first semester of college. MY Access!® College Edition is a Web-based platform that provides prompts and writing activities for all subjects. Developed specifically for higher education, MY Access!® College Edition helps students improve their critical and analytical writing skills by walking them through the writing process and providing them with instant essay scoring and detailed feedback. Instruction is geared toward the expectations in college writing, namely the analysis of facts and showing greater interpretation when responding to assignments. Full reporting options allow your students to track their development and know where they need additional focus and refinement. CorrectEnglish® is also available to individuals. As the industry-standard solution for independent, instant, and accurate writing feedback, CorrectEnglish® goes beyond the simple checking of spelling and grammar. It is a complete writing development solution designed to support the writing process from simple grammatical checks to composition and publishing. CorrectEnglish® offers the editing tools and style resources (MLA, APA, Chicago, CBE) needed to compose exceptionally written research papers, proposals, abstracts, essays, and more. It also offers opportunities to check your work for originality. An administrator’s ability to interact with his/her data to get actionable answers is critical in making informed decisions quickly and effectively. Rather than a pre-defined set of static reports, iSEEK Supercruncher™ offers infinite scalability that makes every conceivable combination of inquiry related to performance management available in seconds. This unique approach to flexible data selection and drill-down capability guarantees the data to be actionable for the decision-making process. With this simple question-and-answer interface, institutions can save money on data warehousing and eliminate risks of wasted resources associated with knowledge deficit. Through our affiliated operating company Vantage Learning, McCann Associates provides accountability solutions for districts and schools across the country. Our proven technology and professional development services provide teachers with the tools and training needed to be highly effective in the classroom. This results in the creation of a sustainable model for student improvement and links teacher effectiveness to student outcomes.